We went to the farmers market yesterday and picked up lots of goodies. 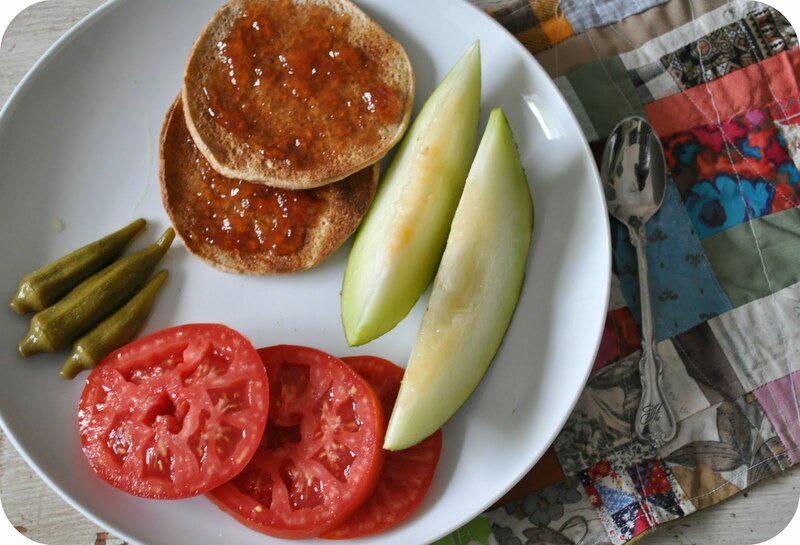 I've been snacking on Santa Claus melon, pickled okra, tomatoes, and toast with muscadine jelly. I hope you can find a produce stand and pick up some summer goodness while adventuring this weekend. We also started packing up our Cd's yesterday and I found my Secret Sisters CD. I've been listening to this lovely song and looking forward to our fall camping trip in the Smokey Mountains. Did I tell you that we reserved our favorite camping spot next to a river? We can't wait to take Bono Baby camping again. YUM! pickled okra is the best! Yum! Our local farm stand just opened up - I love taking the kids there to find things that add to what we are already growing in our garden! Happy Packing!!! You'd think we'd love doing it since we've both done it so much over the years, right?! how have i not heard of the Secret Sisters? what a great song... i think i will leave it on while i make mozzarella/tomato + basalmic vinegar salad for lunch. i haven't gone camping in ages... i miss roughin' it and enjoying fresh air and nature. i can't wait to see photos! Wow, I'd love to go camping in the Smokey Mountains. I'm so jealous! I love Secret Sisters. I'll be seeing them in just two weeks!